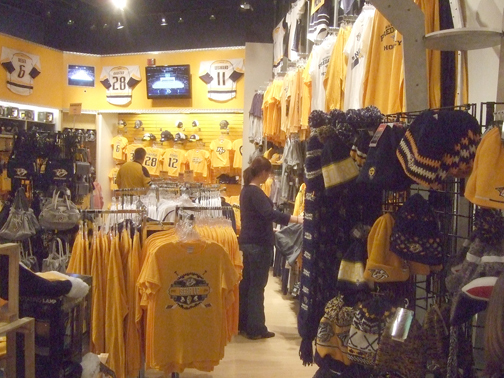 Fans seeking Predators merchandise will soon have a larger store to shop, thanks to renovations at the rear entrance of Bridgestone Arena. In the financial market, there is often a direct link between a stock’s past and future performance. The same correlation can’t necessarily be made in the sports business world about a team’s on-field performance and the success or failure of its merchandising efforts. Consider the season records of the four major local teams followed by most Nashvillians. The Titans (5-8) and University of Tennessee (5-7) have experienced down years. The NFL team’s playoff hopes are on the ropes, while the Vols failed to make a college postseason football bowl game for the third consecutive year. Meanwhile, Vanderbilt University (8-4) is headed to its third consecutive bowl game under coach James Franklin. And the NHL Predators (13-14-3) are struggling to ride a roller coaster season. But how much do those season records factor into merchandise sales? It depends on who you ask and when you visit. Business appeared brisk at several sports shops visited over the Thanksgiving/Black Friday weekend and as the Christmas shopping season began. The Titans, who are coming off a 51-28 loss at Denver, went 0-3 in the month of October. But that month, sales of their gear at NFLShop.com rose 33 percent vs. the same time period a year ago, according to an NFL spokesperson. The Predators may be struggling on the ice, but the NHL team is just months away from opening a new pro shop at Bridgestone Arena that will be nearly four times the size of the current store, says Gerry Helper, the team’s senior vice-president of hockey communications and public relations. 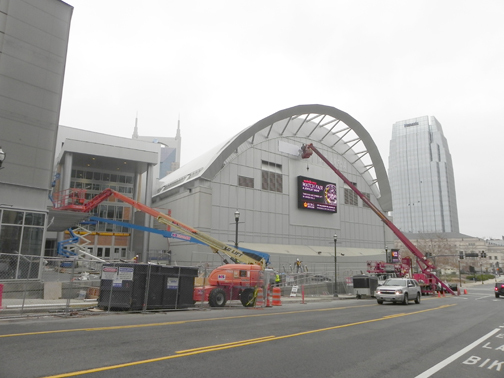 Bridgestone Arena is nearing completion of a multi-million dollar facelift that will include a new entrance at 5th and Demonbreun. It will cater to fans coming over from the new Music City Center and Omni Hotel. As part of that expansion and renovation project, the Predators will open a pro shop at that rear entrance that will measure some 7,200 square feet. “Our current store is 1,800 or 1,900 square feet, so that obviously provides us great opportunities when it opens next spring,” Helper says. He adds that merchandise sales through 30 games of the 2013-14 season are comparable to 30 games (when they were 11-13-6) into last year’s strike-shortened season. “They’re at about the same level as last year, so we’re in pretty good shape there,” Helper adds. Football merchandise sales for in-state rivals Tennessee and Vanderbilt provide some curious numbers – and not at all what one might expect. According to the Collegiate Licensing Company’s list of its Top 75 institutions, based on royalties of all collegiate merchandise sold for the fiscal year July 1, 2012 through June 30, 2013, Tennessee ranked 15th and Vanderbilt 58th. While the Predators are struggling in the standings, team merchandise sales are about even with last season, senior vice president Gerry Helper says. On Nov. 11 of this year, the CLC’s Top 75 list of reported royalties of all collegiate merchandise sold for the first fiscal quarter of 2013 (July 1-Sept. 30), the Vols moved up two spots to No. 13, while Vandy dropped one spot to 59th. But those quarterly numbers can be misleading, with licensees’ royalty payments varying from institution and factoring in such things as coaching changes, uniform changes (think UT’s Smokey Gray jerseys) and different sports seasons. For example, Kentucky is ranked No. 11 in the 2013 first fiscal report, and it can be inferred that Kentucky basketball merchandise is far more popular than the struggling football team’s. Hoops also reigns supreme at Duke, but the Blue Devils ranked only 39th in first-quarter royalties. Texas is ranked No. 1, followed by Alabama, Notre Dame, Michigan and Georgia. The college football bowl season puts pressure on retailers to have merchandise on shelves as soon as possible. That’s especially true for CLC, the official merchandising partner of the First American Mortgage Music City Bowl, which will play host to ACC representative Georgia Tech (7-5) and Ole Miss (7-5) of the SEC. Kickoff is set for 2:15 p.m. on Dec. 30 at LP Field, giving all involved just 16 days to get merchandise on shelves from when the opponents were announced on Dec. 8. The same deadline holds true for Middle Tennessee State (8-4), which will play on the same date in Fort Worth, Texas, against Navy (7-4) in the Bell Helicopter Armed Forces Bowl. Vanderbilt will have a little longer to market and sell merchandise. The Commodores (8-4) don’t play until Jan. 4, meeting Houston (8-4) in Birmingham, Ala., in the BVAA Compass Bowl. Generally speaking, official bowl merchandise sales hit a quick spike in online orders immediately after pairings are announced, but the majority of sales come the actual week of the game and on-site game day. Ole Miss and Georgia Tech can apply for a license through CLC to carry official bowl-branded items in their on-campus stores, Franklin American Mortgage Music City Bowl officials say. Sports Seasons, with stores throughout Middle Tennessee, carries some of all those teams’ clothing, as well as a variety of pro apparel, but the local teams are still kings of sales, White Bridge Road store manager Eric Provo explains. “You expect the Titans to sell, but there are Steelers and Bears fans everywhere,” he explains. “We carry Broncos gear because of (ex-Vols star) Peyton Manning. We had some Chiefs fans come in because of Eric Berry (another ex-Vol) when Kansas City played here, and we sold out of Colts hats for that game. But Provo admits team records play a factor in sales. Win or lose, dedicated fans – like all savvy shoppers – are quick to take advantage of discounts and sale prices. Hundreds of sports fans converged on Logo Chair’s annual two-day warehouse in late November for its sale of college sports gear. Putting on a pre-Thanksgiving/Black Friday blitz works out well, says Logo Chair president Matt McCall of Spring Hill. “This is our fifth year for this sale and it has far exceeded the others. We’ll double the number of checkout scanners next year,” adds McCall, who said he anticipates doing “about $23 million this year” after starting the business 14 years ago in his parents’ garage in Memphis. The holidays spur buying and so do bowl games. “We’re getting blankets for our bowl game, coolers and tailgating supplies,” Vanderbilt fan Sara Reynolds Frederick of Nashville said during the sale. Kyle Hendrickson of Murfreesboro and 7-month-old son Charlie were also at the November sale, loading up mostly on Vanderbilt items, but also other schools. “We bought a lot of Christmas gifts for relatives, so we end up buying a lot of different teams,” Hendrickson says.